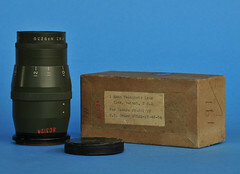 Ilex Manufacturing Co. was one of America's three main suppliers of lenses for view cameras. 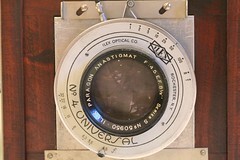 It was founded in 1910 by the former Bausch & Lomb shutter designers Rudolph Klein and Theodor Brueck. They invented a delay mechanism that made shutters working independently from climate conditions. Their lens brand was Paragon. Many of the Universal shutters have the speeds T, B, 1/100, 1/50, 1/25, 1/10, 1/5, 1/2, and 1 sec. Most ACME shutters have additional 1/150 sec. Press shutters are everset leaf shutters. When a "Synchro" variant exists the other variant is unsynchronized. with speed only up to 1/50 sec. Paragon Anastigmat f4.5 3 1/2"
This page was last edited on 29 August 2017, at 10:34.